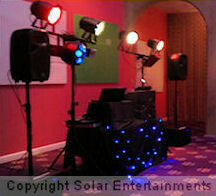 Solar Entertainments offer an excellent online music request system to our clients and their guests. 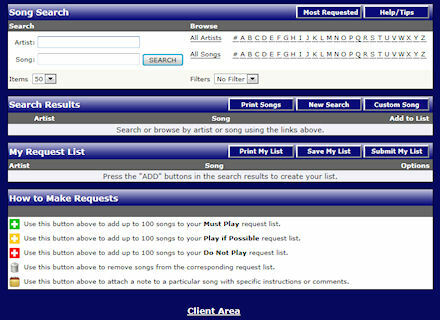 The music request system offers a vast industry standard music selection to choose from. Music is easily searched in different ways and is also categorised by Era. The most popular music requests made at thousands of events over recent years can also be viewed. These most popular requests can also be categorised by era, by wedding first dances, bride and father dances and so on. This system can help greatly with music ideas for your event and to allow you to build a selection of requests identified as 'Must Play', 'Play if Possible' and 'Do Not Play'. Additional notes can be added against requests (to request a dedication or to indicate a first dance etc). Clients can also offer the service to their guests and allow them to select a pre-determined number of requests each. Clients always have full control over these requests and can amend or remove if necessary. We impose no limits on the number of requests that can be made. Some clients are happy for us to choose all the music, some like to specify preferred genres and a few specific tracks, others have very particular tastes and specify the majority of tracks to be played. We cater for all. Logins to the online system can be provided upon booking confirmation and the system is then accessed via the links on the left-hand side of our website.